I have a strange feeling like I'm at home. It's an extraordinary feeling which hits you when you are in parts of California and Alaska, in places where there were Russians. Yury Moroz is a well-known Russian director, making a film about the history of Fort Ross. This fortress was founded by Russian pioneers in America two centuries ago in what is now California. This story is about time travel. The main characters are our contemporaries. Suddenly, they appear in 1820. This is when Fort Ross and Russian America were in their heyday. Then the characters moved to 1825, but . . . I won’t give away all of our secrets. The movie is a traditional love story combined with a good old-fashioned western. The hero falls in love with a young Spanish woman, setting the stage for fighting, intrigue, politics and, of course, adventure. The initial task of the old pioneers was to explore new territories, to build, to see, to learn, to fall in love and start families, to plough and to trade. It was in this spirit that Fort Ross was erected under peaceful circumstances. In fact, not a single shot was fired as the pioneers built their new home. The settlers of the Russian colony adapted well to their new surroundings, by planting gardens, harvesting grain, and becoming professionals in hunting and fishing. They were also the first to bring glass. The Kuskov House was the first building here, at colony Ross, to have glass windows, so the first in all of Spanish California to have windows. Look, it’s a unique place. The harbor is small, but perfectly formed and makes a circle. It’s deep enough for ships to come in. Fort Ross acted as an important trade center between Russia, the US and countries in South East Asia, but it also served another purpose. As ships loaded with food sailed north, they brought back a fortune and the fur trade. This was a vital lifeline to the heart of Russian America further up the coastline. "Who knows what Russian America is?" Professor Alexander Petrov is a Doctor of Historical Sciences and is a world-renowned expert on Alaska and on Russian-American history. The success of the Russian-American company comes down to the vision of one man: Grigory Shelikhov, a merchant from a small town called Rylsk on the southern border of Russia. If it weren’t for Shelikhov, there would be no Fort Ross and no Russian America where we are now. Shelikhov. Let’s check the year – 1795. Shelikhov’s expedition to America was different from any other merchant’s venture at that time. Shelikhov traded furs, but he also decided to annex new colonies making them part of the Russian Empire. This is a unique log documenting Grigory Shelikhov’s sailing expedition in 1783. In an extraordinary move, Shelikhov took his wife Natalia and their young son Mikhail on the expedition with him. A strong woman in her own right, romantics like to say she loved him too much to let him go off alone. I think she did, but she got married when she was very young. I don’t think she really had a lot of choice in the matter. And I think that she idolized her husband to a certain extent. Dawn Lea Black is an American historian and writer, and she has been studying the history of Russian Alaska for decades. She and Professor Alexander Petrov co-wrote a book about Natalia Shelikhov, and her role in the history of the region. I think I can understand her, and therefore I identify with her. And I think that she did things that are very unusual and wonderful, and yes, she was a very unique woman, and I do identify with her. In August 1784, Shelikhov, his wife, son and the crew sailed into Kodiak Island. This first settlement in North America was a very important event for the Russians, and in American history as well. The couple spent two years in Alaska and created their fortune in the fur trade. During this crucial time, the expedition laid the foundation for the development of the entire territory. Shelikhov wrote the charter of the Russian-American company which controlled the expansive land and defined the borders of Russian America. Shelikhov had the idea of calling this land as Slavorossiya meaning ‘Russia’s Glory', but settling this new frontier was anything but glorious. When the Russians came to Kodiak, they were hostile, no-good people. The ranks of the expedition consisted of a volatile mix of peasants, escaped convicts and military deserters. There was a solar eclipse a few days after the expedition arrived. The natives considered it a bad omen and attacked Shelikhov’s settlement. Shelikhov and his people protected themselves ferociously and with superior cannon firepower. Life in the new frontier was anything but peaceful, as clashes with the local tribes continued with Shelikhov’s brood and even subsequently with the long-term governor of Alaska – Alexander Baranov. Critics of the Russian-American company allege that the group brutally kept the indigenous women and children in unfathomable conditions, while the men were sent to do the harsh work of the fur trapping. Later, Shelikhov wrote, ‘I tried to avoid bloodshed as much as I could, and I wished to live in peace with these people’. My mom and dad said, 'They were the best people in the world'. When I went to my mom and dad and asked, ‘What did the Russians take away from you when you were growing up?' They said, ‘Absolutely nothing’. Shelikhov worked hard to provide a better quality of life for the native tribes. He gave them tools and equipment, taught farming and even organized a school system. The Russians brought a huge herd of the dairy cattle. My mom was making butter when she was 8 years old. The Russians brought raspberries, and they brought gardening. They taught my mom and dad how to plant potatoes in the sand using kelp for fertilizer. The news of this developing cooperation began to spread, and soon other natives started to ask for help and protection from the Russians. Of course the laws of nature apply on the frontier, so you can imagine that it didn’t take long for the Russian men to become intrigued by the local beauties. After nine months on Kodiak, an Alaskan population boom began. Young Aleutian women started giving birth to pretty Creoles, the so-called children of mixed marriages. New families were formed. A new integrated society was created which began to thrive. Shelikhov wrote to the Russian government to find out how to deal with this unique situation. The answer was, 'To make them all Russian citizens'. The Russian settlers recognized the local population as true Russian citizens with all that is entailed. 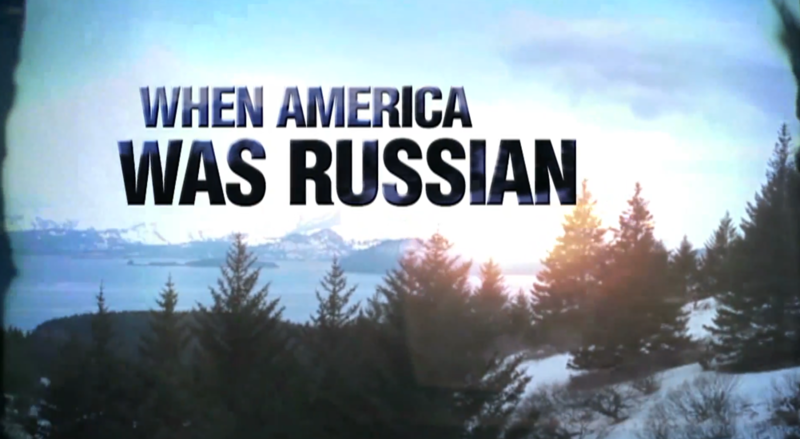 Russians have lived in Alaska for generations. The families grew large, creating new traditions, assimilating different cultures, while still preserving their Russian identity. This building is the oldest building in Kodiak, and, in fact, it’s the oldest building in Alaska. Still standing, it’s over 200 years old. Russian journalist Anna Vernaya has been living in Alaska for 20 years. She’s collecting information about the descendants of the old pioneers. Her goal is to produce a book with interviews detailing their versions of the history of Russian Alaska. This is Gilda, her daughter Tammy, and Tammy’s daughter Nikita. They are a big family with a very well-known name in the region: Shellekhoff. The family business is fishing. "Thank you very much. It’s very good." The small town of False Pass on Unimak Island is the Shellekhoffs’ family home. Gilda is the chairman of the local fish processing company. Since fishing is a seasonal business, Gilda spends the winter months on the mainland in Anchorage, a city where there is a street named in Grigory Shelikhov’s honor. "Yeah, and even though ours has two L’s and two F’s, it’s still pronounced ‘Shelikhov’." "Pronunciation is the same, and it doesn't matter how many F's or L's." But there’s a mystery in Gilda’s family lineage. Her great-grandfather bore a different Russian name, Dushkin, and no one really knows where the current family name of Shellekhoff came from. According to journalist Anna Vernaya, it’s a known fact that Grigory Shelikhov only had children with his wife Natalia. "He had only two daughters." "So apparently what happened is Aleuts were baptized and given the name of the sponsor." "There’re two ways. You could marry a Russian and get the name, or you could get it through baptism." To gain a godfather or godmother for the native children in Alaska was very important for the Aleuts. Aleuts respected their godfathers even more than their fathers by blood. They never worked for another merchant, but showed loyalty only to their godfather. When the merchant left for a year and gave them an order to get lots of furs, they did everything that was asked of them. An essential part of Russian culture is religious faith. Just like the merchants and traders, the missionaries were faced with many and various challenges. But while traders could go home, any journey to Alaska for a priest meant a lifelong commitment. My mom and dad were with the Orthodox Church all their life. Grigory Shelikhov organized the first visit of Russian Orthodox missionaries to Alaska in 1794. Among 11 priests from Valaam was St Herman of Alaska who was canonized in 1970. And we were part of the information that they gave in order to canonize him. Number one. My brother couldn't see. His eyes were almost blind. And for years my mom was working on him and his eyes. She was told to go to the monastery and look for Father Herman. He told her to put dirt on my brother's eyes, and to drink holy water from the river all the time. Then it wasn't long, and he could see. Father Innokenty, a local priest from modern-day Kodiak, is getting ready for a boat trip to Spruce Island, where St Herman spent his last years and was buried. It’s about 2 kilometers from Monk’s Lagoon. And this cell is preserved from essentially the last time that Father Gerasim was able to live here. His library is here. Father Gerasim was very creative, and he did these dioramas: Christ in the Garden of Gethsemane, Saint Mary of Egypt. And you can see that the moss that he used is still green. Father Innokenty, rector of the church, refers to the island where St Herman lived with religious reverence. If you look at the moss on the trees, this is very unique to this part of the island. And here on the island is where Orthodoxy first came to North America. And [there's] a very famous story of a tsunami that was coming, and he placed an icon of the Mother of God, the Theotokos, and declared to the people that the tsunami wave wouldn’t go beyond that line. In so doing, the people came and were baptized and became Russian Orthodox. Religion still plays an important role in modern-day Alaska. Here, you’ll find an unusual mix of Eastern Orthodox traditions and the local people’s ancient rituals. The church defended the local populations, and stood up for the Aleuts. Perhaps a strong connection still exists today, because the native people always found an advocate in the Orthodox Church. In fact, St Benjamin was quite impressed by the moral purity of the local tribes. Shortly after his arrival in Alaska, he wrote, ‘There are no better people than the Aleuts’. The indigenous people of Alaska are now, of course, thoroughly modern, and like all of us, enjoy the technology and comfort that the 21st century has to offer. But just as important are their deeply held cultural and spiritual beliefs. If you ask about their Russian heritage, they don’t talk about the Russian-American trading company. Rather, they talk about the Russian Orthodox Church which they call their own. They say, ‘This is our culture, these are our traditions’. This is an Aleutian cemetery. Through the years it has become a tradition to paint the small tents over each grave in bright colors. To compensate for the harsh and cold climate here, the dead are buried with warm blankets. The aim of these rituals is to ensure a happy and comfortable afterlife for the departed. Here you can see how important it was for the Aleuts to hold on to their old Russian traditions. (Russian) Very very old books! This is actually St Innocent’s diary. You can’t touch it. It says, ‘St. Yakov Netsvetov’. He was a Creole priest who brought the Orthodox Christian faith to the Athabascan and the Yupik. St George translated the Bible from Russian, his father’s native language, to his mother’s, helping to further spread the Russian ideologies and religious traditions throughout Alaska. He had these stones inscribed. He married an Aleut woman, and they had three sons. One of those sons became the first priest. The distinct onion domes of Russian Orthodox architecture still exist in the area today. In America, believers can pray in the presence of the icons that were brought from Russia almost 200 years ago, in churches scattered throughout Alaska and in parts of California. Fort Ross was built in California in 1812 by Shelikhov’s men. The fortress burned down several times, but it was always rebuilt, providing a unique window to the past. Artifacts recovered through various excavations have been placed in a local museum for tourists to enjoy. However, in 2010 a crisis loomed over the facility, and it seemed that the Russian landmark with two centuries of tradition and history would be lost forever. Because of financial trouble and politics, a list of unprofitable cultural buildings in California was made at the governor’s office. The list included Fort Ross. Our Former governor Schwarzenegger was going to close the fortress. There wasn’t any money. It was a crisis. The people of Sonoma County, California, couldn't imagine their community without this important Russian landmark, and thus began a campaign to save Fort Ross. At that time, I was President Obama's advisor, and really supported the project. The Russian government provided financing for the project. Russia and America are superpowers. That’s what we are, and as such, we have certain responsibilities to the world. As we expanded our respective territories, we met in California, and this is part of our shared history. Michael McFaul has visited sites in Alaska and Fort Ross in California many times. Fort Ross especially holds fond memories for the ambassador, because it was here that he proposed to his future wife Donna Norton. It was a very romantic place. They say it has preserved the Russian spirit. I don’t really know about that. This place was more about us than about Russia. The location was perfect, and I’m very glad our engagement took place there. It was a happy and mutual decision, and we’re still together. And speaking of romance, one of Russia’s celebrated tales comes from this era in Russian-American history. The stage is set in April 1806, when Grigory Shelikhov’s son-in-law Nikolai Rezanov arrived in San Francisco. The love story that unfolded during his visit gained fame in Russian pop culture, and a sad but beautiful rock opera was staged by Moscow’s Lenkom Theater in the early 1980s. Here’s my favorite character of Russian America. Have you heard about Nikolai Rezanov? In 1803, his beloved wife Anna died leaving him two children. The disconsolate widower set off on his first trip around the world. The purpose of Rezanov’s visit was to get food and bread for the Russians in Alaska, and to establish friendly relations with the Spanish governor of Upper California. At some point, Rezanov met the governor’s 15-year old daughter Concepción Argüello. They fell in love, and Rezanov proposed. But tragedy soon struck, and the doomed couple was never to marry. Nikolai Rezanov died just two months after leaving California for St Petersburg. The governor’s daughter Concepción Argüello is buried here in St Dominic’s Cemetery in Benecia, California. This is her grave. She died almost 50 years after Rezanov, still true to her love. Every day for the year Concepción would come to the sea waiting and hoping for his return. Rezanov died during his journey to St Petersburg where he was supposed to report to the Tsar about securing the good prospects for the Empire in North America. When the news of Rezanov’s death reached Concepción, she chose a life of celibacy and became a nun – Sister Dominica. Skeptics maintain that the couple’s engagement was merely a political trick designed to create a diplomatic bond with the Spanish government in California, but romantic history buffs know the truth. It’s a myth that Nikolai Rezanov’s proposal to Concepción Argüello was some sort of a ploy, and that he was prepared to give up his freedom for the benefits of his country. In his last letter to his brother-in-law Mikhail Buldakov, he wrote about his love for Concepción and that he was brokenhearted. Back in Alaska, it can be said that there’s now a new Russian America. After the collapse of the Soviet Union, it’s estimated that more than 5,000 Russians moved to the 49th US state. Now, they have assimilated and are part of the local community. On the surface, it all looks like a typical rural American town. Here Russians live in harmony with Yupiks and other native groups, and it makes them better people for it. Yupiks in particular are welcoming, but they never forgive lies. If you deceive them just once, they and their whole community will never trust you again. It is because of this trusting and open environment in the remote villages of Alaska that people don’t lock their doors. Though the heritage is very similar, Russia itself seems so distant to many of the Russian-American descendants living in the US. So it seems only natural that the Komarov family is on a pilgrimage of sorts from the village in Alaska. They’ve come to the old town of Borovsk on the Russian mainland to see and experience the home of their ancestors. I think that’s why we’re here. We’re Russian Orthodox, and we came here to see Russian Orthodoxy in real life instead of just what we know in our village. In the Alaskan village where Anastasia Komarov lives, people still think that the words "Orthodox" and "Russian" are synonymous. They’re wonderful people. People who are living there 120 years after Alaska was sold. Still, they say that they’re Russian. I heard them singing in the churches in the Aleut language, but with a Russian feel. And their names are Russian. Danah is my granddaughter, and I was teaching her Russian. So I wrote about 200-300 words, and the only way I could teach her Russian was to write them down in English letters. To go back to my mom and dad, my dad went only to Russian school, and my mom went only to Russian school. "Yeah. The only education was Russian." The first schools in Alaska were built by Grigory and Natalia Shelikhov. Later, those children who wanted to continue their education were brought to the city of Irkutsk in Russia. They lived in Natalia Shelikhov’s home. She took care of them, helped them and provided for their needs. Natalia Shelikhov was indeed a smart woman. She was truly the business lady of her time. She knew how to deal with profit-driven traders and merchants. She also knew how to bargain and wasn’t afraid to say no to the powerbrokers. She accomplished so much, and yet she herself couldn’t write. Natalia chose husbands for her daughters: A merchant Mikhail Buldakov for her younger daughter who was born in Alaska, and an aristocrat Nikolai Rezanov for her elder daughter Anna. The Russian-American company that continued Shelikhov’s enterprise wasn't established until July 1799. A few years after his death, his wife Natalia made it her mission in life to continue her husband’s work, and was quite successful in making that happen. She appointed her son-in-law Mikhail Buldakov as director of the Russian-American company. The Russian-American company led Russia’s trade in North America and cooperated with all the nations in the region right up until 1867 when Alaska was sold to the United States of America. It was a very profitable trade, and the Russian-American company happened to be the most profitable shareholding company of the 19th century. Unfortunately, Natalia Shelikhov didn’t live to see the glory of her achievements. It happened that the business was taken from Natalia by her sons-in-law, and she was left to her own devices. She started drinking and died in 1810. She’s buried somewhere in the Donskoy Monastery Cemetery in Moscow, but the location of her grave is unknown. Her relatives were negligent and didn’t take the trouble to preserve the memory of this great woman. Grigory Shelikhov, the Russian seafarer and pioneer, died in 1795. Five years after his death, his widow Natalia Shelikhov funded the construction of a memorial to the great man in Irkutsk, Russia. He really was the hero of his time. Everybody who knew Shelikhov felt his extraordinary energy. He was no ordinary merchant. On the contrary, he explored the world opening up new territories for his country. Grigory’s talents didn’t end in the realm of exploration. He was also an economic visionary. In the mid-19th century, the Russian-American company lost a sale of furs in China because of an uprising. The company started a practice in business that was unheard of at that time, hiring analysts whose sole responsibility was to follow the trends of the trade. They began to study the markets. The Russian-American company was able to take command of the markets in China. From California across the Pacific Ocean, ships went to Shanghai. Later, they discovered new markets in London, New York and even closer to home in San Francisco. That is, they were able to take advantage of policy changes in the market for the benefit of the company. Now, in the 21st century, there are main discussions at EU summits on financial markets and international trade relations. One main concern is how to make South East Asia a free-trade zone. For Grigory Shelikhov, this wasn’t a problem at all. The merchant traded freely with the entire world. Here you begin to understand what the first explorers were all about. They wanted so much more than just to come here. They wanted to bring Russian culture together with their ideas of how to develop this land and how to make a prosperous life far away from Russia. In 2012, Fort Ross celebrated its 200th anniversary. The occasion was marked by a small ceremony in the spirit of how the settlement thrived. Cooperation between the native peoples and those who hold Russian America near and dear. The dynamic days of Fort Ross mark an important era in history, and international relations for both the US and Russia. Had the timeline of events been altered even slightly, the political map of the United States could have looked drastically different today. He came to the shores of the Pacific only two months after Lewis and Clark left the Pacific and went back to the West. Basically, it was the meeting of American and Russian frontiers. And again, it happened exactly at the same time, at the beginning of the 19th century. To try and recapture the spirit of Fort Ross when it thrived, our film crew has had to travel to Malta, all too aware that the real Fort Ross was sold, forgotten and nearly lost to the ages. The reason for the selling of the Russian fortress is a mystery. Even historians don’t know the answer. The entire estate where two Russian-named rivers – the Slavyanka and the Rousskaya – flowed, where a house with all of its equipment stood, and where gardens and orchards even the famous Californian vineyards thrived, everything was sold for only 42,000 rubles in silver at the time. To the North in Alaska, the end of Russian America is an even sadder memory. The territory vast enough to hold England, France, Spain, and Germany combined was sold for only $7.2 million. In other words, just two cents an acre. The money funded the Moscow railways: Moscow—Ryazan—Kursk line. There was a diplomatic scandal in the US after the purchase of Alaska. Congress even created a commission to verify the circumstances of the transaction. Initially, people in the US thought that it was an incredible mistake. The most important and interesting thing was that the Russian-American company directors didn’t know about that. Everything was kept in secret. So the Russian government actually sold Russian Alaska without informing the company that basically ruled the whole Russian territories in the North Pacific. History has now put everything in its rightful perspective. The purchase of Alaska is considered an incredible and significant victory for American diplomacy. "When was Alaska sold to America?" We don’t know why these decisions were taken. Someone was very clever and decided to do it. It was against the majority, but it’s a part of our American history now, and we are very grateful to the wise men who brokered the deal. Russian and CIS citizens can empathize with the feeling of the population when they learned that Russian America had been sold. An empire split, but Creoles and Aleuts are happy. And people might wonder what their fate would have been, had Alaska been part of the Soviet Union when in collapsed, what would have become of Alaska. We can say that history has been kind to Alaska in this regard. My own opinion is that it was a good deal for us living here. Your government would never be able to control us born and raised here. We got everything here, and we got a very good education from the Russians, and I’m so proud to be a Russian.